Coye Law Firm had represented thousands of consumers in large and small, simple and complex legal cases in Florida, New York, District of Columbia, Georgia and Michigan. The firm’s attorneys include Wade Coye, Amber Williams, Marchella McGinnis, Corinne Huston, and Stephanie Torres. 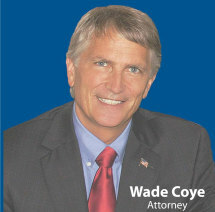 The firm’s founder, Wade Coye, has been practicing law over 28 years. He received his law degree from the University at Buffalo Law School with honors, and was admitted to the Florida Bar in 1989, the District of Columbia Bar in 2008, the Michigan Bar in 2015, and the New York Bar in 2015. He is AV rated, has a Preeminent 5.0 out of 5 from Martindale-Hubbell and has an AVVO Superb 10 rating. Coye has written a number of special reports and books on car accidents, workers’ compensation, probate, disability and veterans affairs. He has also written a consumer-oriented book about personal injury in Florida, Sharing the Secrets, Learning the Lies. His book has received outstanding reviews on Amazon.com. A licensed private pilot with an instrument rating, Coye is married with five children and is the son of fourth generation dairy farmers from upstate New York. Before he founded Coye Law Firm, Wade Coye spent some time in politics and served on the campaign staff for two members of Congress. He also served in the United States Army Infantry. He was an early adapter of computer technology and the Internet, appearing on a national list of the first 50 law firms in the United States with a website in 1995. What makes Coye Law Firm different than other law firms? The firm has built an expert team approach to handling cases that require strong knowledge of multiple areas of the law. Many victims of negligence come to the firm with complicated circumstances or traumatic injuries. Coye Law Firm gives these clients the advantage of having one legal team that can see and understand the significant interplay between every aspect of their case. 8am - 5pm Monday - Friday. Closed Saturday and Sunday. Are you unable to work? Worried about being able to provide for your family? My report will help you understand the basics of Social Security, Veterans Affairs, and private disability and offer some tips and helpful suggestions. If you've recently been in a car accident in Florida you've likely been bombarded with advice from friends and family. In this free e-book, written by Attorney Wade Coye, you will learn 37 secrets and 19 lies about injury law. Injured on the job in Florida? Find out what hurt employees need to know before signing a release, hiring an attorney, or giving a recorded statement. I realized that many people do not have access to solid, honest information about veterans' disability benefits and I wanted to change that. The better you understand the system, the quicker you can receive the benefits you deserve. Want to Save Time and Money on Probate? Starting work on estate matters early on can save thousands of dollars. Request my Special Report today!